My wife and I have been church shopping for a while now. We visited Fruitvale Presbyterian where monteskewed is currently pastor, and our neighbor's church in Berkeley, but we've got a fairly long list of ones we want to check out. So today we visited Lake Merritt United Methodist Church, which was celebrating the 25th anniversary of its formation via the merger of two other UMC churches. The congregation is very Oakland -- diverse. On a church media website I frequent, you'll often hear the phrase "the church is not the building" (we even sang a song about that today), usually when someone wants to include the building in the new church logo they're designing. Churches aren't buildings, they're communities of faith, (hopefully) with a common mission of spreading the Word and living it. But Lake Merritt UMC has a nice building overlooking the south end of the lake, with some astoundingly beautiful art, a 3-panel Tiffany mosaic titled Te Deum Laudamus. Each panel is 17' high by 8' wide and made of millions of pieces of opalescent glass. Together they dominate the sanctuary, overshadowing the great view of the lake (even on a beautiful day like today.) Ironically, while Lake Merritt UMC is very diverse, and open and affirming, the mosaic suffers from the same flaw as many classic works of art: everyone in the image is white. Regardless, the pictures don't do the art justice, so it's well worth seeing in person. After church, we drove around the lake, hoping to find one of the restaurants on our list to check out that was open. Rico's, The Red Door Cafe, etc. were closed, but Golden Lotus was open. The food was great, and it was real treat for me being able to order anything on the menu. We'll definitely go there again. 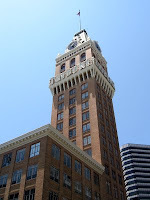 We walked around a bit admiring the beautiful buildings in Oakland, and I had my camera for taking more sign pictures. Next we continued around the lake and did our grocery shopping at Trader Joe's. While I parked the car K went and got some coffee beans at Peet's. We looped back across the freeway and down MacArthur to Park, and came home to enjoy the rest of this beautiful Oakland Sunday.